An on demand sharing economy for digital financial assets. Alkemi - An on demand sharing economy for digital financial assets. Data pipeline syncing your business’s crypto transactions to traditional accounting systems. Gilded - Data pipeline syncing your business’s crypto transactions to traditional accounting systems. Paperchain prices the daily analytics data of the world's leading digital media platforms allowing media companies to get forthcoming revenue paid immediately. Paperchain - Paperchain prices the daily analytics data of the world's leading digital media platforms allowing media companies to get forthcoming revenue paid immediately. Discover and invest in the next generation of startups. 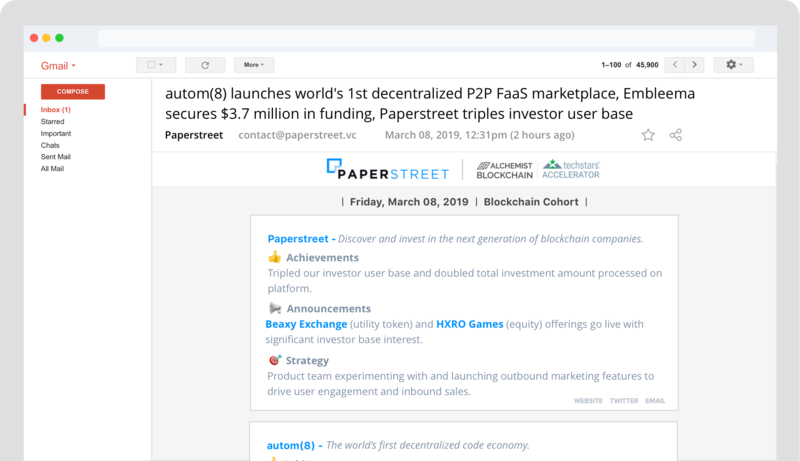 Paperstreet - Discover and invest in the next generation of startups.